B Snorkeling Costa Rica in warm tropical waters offer some of the best scuba diving and snorkeling in the world. Because scuba diving has only recently caught on in Costa Rica, the dive sites are still incredibly pristine and undisturbed. You’ll be exploring an underwater wonderland that few others have experienced before you. 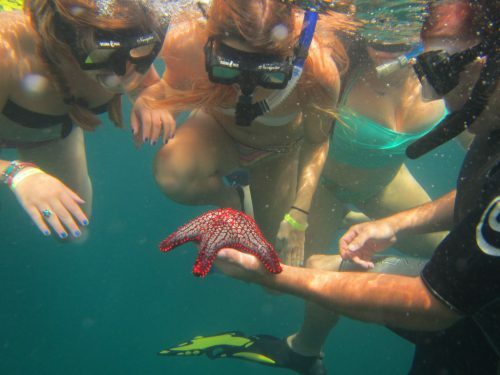 What makes Costa Rican snorkeling so spectacular is its incredible variety of marine life. The plankton rich tropical waters support a vast number of fishes, sea mammals and reptiles (sea turtles). The water is delightfully warm and offers great visibility year round. Both the Pacific and Caribbean coasts offer luxurious accommodations and tons of exotic on shore activities as well. The Caribbean side offers some of the best beach dives and snorkeling in the country. The water temperature is a balmy 80 degrees and visibility can be up to 150 feet. There are several reefs to explore and even a couple of ship wrecks complete with cannons! You’ll see many of the same species as in the Pacific but typically not in the huge numbers. species around including white tip sharks, bull sharks, tiger sharks and if you are really lucky you may see a giant whale shark – the biggest fish in the world! There are several mammalian species that call these waters home. These include the mighty humpback whale, orcas, pilot whales, false killer whales, spotted, bottle nosed and spinner dolphins. Whew!! !